Pioneers in the industry, we offer combination machines and material handling trolleys from India. A perfect cut result is guaranteed by the saw unit constituted by a mighty, cast iron structure. Maximum stability and rigidity in every working condition with the spindle moulder unit with a column of large dimension fully made in cast iron. Great attention paid to the quality finishing, with solutions like the thicknesser's outfeed roller in sanded steel or the adjustable pressure on the feeding rollers depending on the workpiece type to be machined. Surprising quick changing from a function to the other. 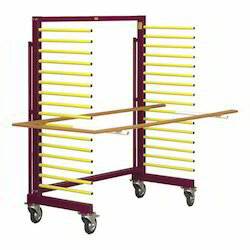 We are offering a wide range of Material Handling Trolleys.